This is my fourth in a series of posts for Nature Rocks, a wonderful movement that encourages families to spend more time outdoors connecting with nature. It's an idea that my family tries to live out each and every day. This week, I'm their featured ambassador, so Nature Rocks will be posting some of my tips for enjoying time outside with kids, and I'll be posting more detailed posts that correspond with each tip. Today's tips is to invest in high-quality baby and toddler carriers. While I really like babywearing for sentimental purposes (is there anything more beautiful than a little one all cuddled up to you? ), I mostly love it because it allows us to explore so many more places much easier. Nowhere is that truer than when getting outside with little ones in tow. After having Big Arrow nearly 3 years ago, we soon realized that most hiking trails weren't stroller-friendly. Fortunately, we had a hand-me-down Baby Bjorn* and learned that he loved hiking as much as we did. As he got older, we found a Kelty Kids backpack carrier* on deep discount. My husband still wears him in that on difficult or long trails (or when he's being uncooperative, lazy, tantrum-y, etc.). When we knew Little Arrow was on the way, I wanted to beef up my babywearing options. A friend made me a great ring sling. Little Arrow loves to snooze in it, and I can see us putting it to good use around a campsite at naptime. I'm told they're great for holding tighter to squirmy babies in a pool, too. I'll give that a try this summer, I'm sure. My favorite purchase for Little Arrow has been an Ergo carrier. * I like the Ergo for our outdoor use for a few reasons. The fabric is cool and breathes well. Once I got the hang of it, it's really easy to get it on and off and for Little Arrow to get comfortable. I love its sun shade feature, especially once Little Arrow falls asleep. And most importantly, it's the most comfortable carrier I've worn yet. Little Arrow spent hours in it on our trip to Florida, and not once were my shoulders ever sore. Get comfortable with your carrier around the house first. For example, I wear Little Arrow almost every afternoon while Big Arrow is playing in the yard. 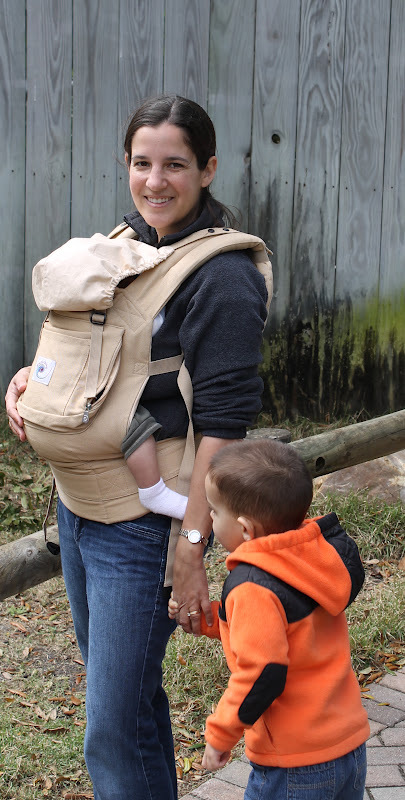 Not only will this get you more comfortable with the carrier, but your baby will get used to it as well. I'm always more confident figuring things out in the privacy of my own home and yard, and then I feel like a pro when we're out at the park or on a hiking trail. Layer outside the carrier. I try to only wear a thin layer under the carrier, and then put a zip-up sweatshirt or jacket over it if it's chilly. That way, if it gets warmer later, I can remove the outer layer without bothering Little Arrow. If it's chilly, bring an oversized jacket (my husband's fleece jackets work perfectly), and just zip it up around both of you. Some carriers have special wraps and blankets, but I find them a little overpriced and unnecessary (unless you know you'll be doing a lot of babywearing in cold temperatures). Be mindful of the sun. Even with the sun shade on the Ergo, Little Arrow's legs and arms are still exposed. Make sure you're taking proper measures to protect your little one. Choose hiking trails carefully. You won't want to wear your baby on a treacherous path or one with really difficult footing. 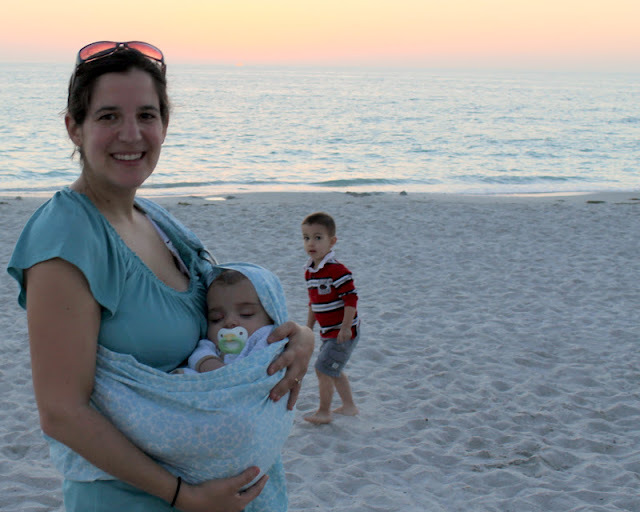 Educate yourself on proper and safe babywearing practices. The Ergo helps me keep up with a toddler and a baby. More fun photos of my husband and I babywearing here! Next up: Tips for giving nature-inspired gifts to your family.